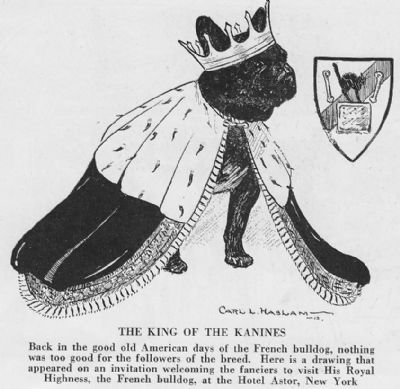 A brief history of the French Bulldog. Historians of this breed have found that what is generally known is that around the mid 1800’s in the south of England,the English Bulldog which was renowned for it's strength and tenacity, was somewhat smaller than bulldogs in other regions of England. In the Nottingham region, textile workers were being made redundant by machinery (the industrial revolution) which forced them to travel to France in large numbers to find work. These workers quite often took along their small bulldogs with them onto the ships. It is generally surmised that seamen liked the small sized dogs because they were easier to smuggle aboard ship and keep out of sight during the voyage. Consequently many small bulldogs found their way across the English Channel as pets. As these workers lived in such restricted living quarters in their ‘new country‘, they needed something to kill the rats that were manifest in these quarters. Their small bulldogs were perfect for this task. 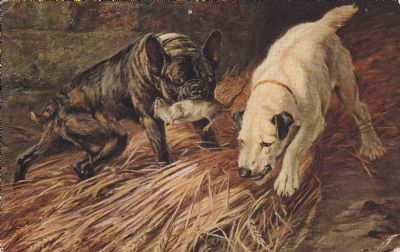 There is much speculation, but it was theorised that these bulldogs were bred with terriers, thus producing the "bat -like ear we see today. In later years these french bulldogs were popular with the "ladies of the night". French Bulldogs were popular with the high society wealthy Americans and they shipped many off to the States. The french bulldog first appeared in the United States in 1896 at the prestigious Westminster Kennel Club’s show in New York. French Bulldogs were popularly nicknamed ‘Frenchie’, a name that has stuck with them to this day. 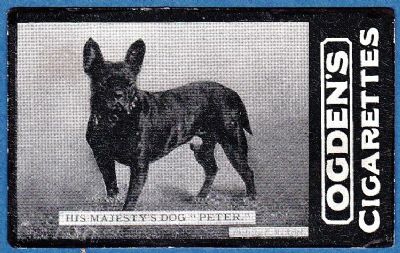 They were a small to medium sized dog weighing under approximately 12.7 kg with short hair and of a muscular build. They were basically a scaled-down version of the Bulldog, or as many people call them, British Bulldogs. What set them apart from the Bulldog were first and foremost their bat-like ears which are held erect, their smaller size and their high level of energy. They had a lively disposition and expression which some described as fun-loving and roguish. They have been described by some as a ‘clown in a philosopher’s cloak’. Fight won by the French Bulldog Club of America now world-widely approved. In 1897 in the United States, exhibitors were disappointed that an English judge awarded a French Bulldog with ‘rose’ (not bat-like) ears as best of breed. The bat ear was then considered an undesirable feature in England. Favoured was the rose-eared french bulldog that in minature form most resembled the English Bulldog. 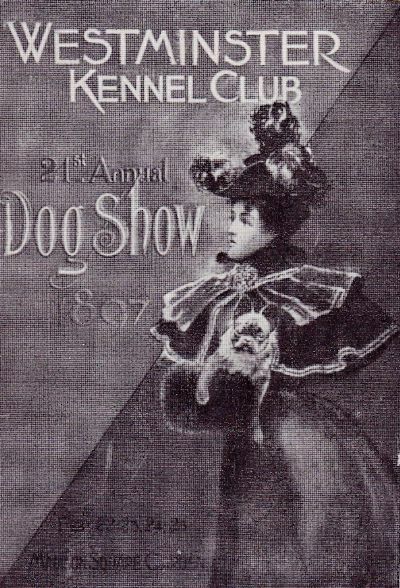 Some of the exhibitors at the Westminister Kennel Club show rallied a meeting and subsequently formed the French Bulldog Club of America (the first French Bulldog Club in the world) and the next year adopted a breed standard which remains essentially unchanged to this day. It was in the United States that the French Bulldog’s bat-like ears were standardised, their smaller size (compared to the ‘British Bulldog’) maintained by a weight limit and their variety of colours adopted. The French Bulldog is a breed that owes it's existence to breeders in countires from France, America, England and Germany. 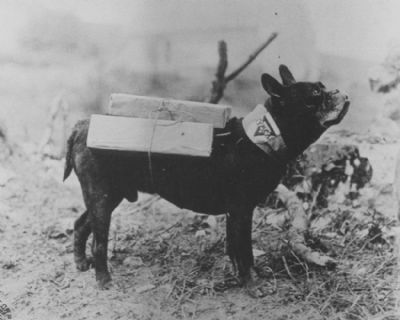 YMCA Cigarette Dog delivery service during WW1. to the soldiers. Dogs provided a psycological comfort, even if for just a moment. shown here carrying cartons of cigarettes for the troops. but Mutt was fortunately smuggled on board. his saviour said they'd have to throw him overboard also. Mutt returned safely to New York. Photo care of War Dogs: A History of Loyalty & Heroism. Le P`elerin Revue (The Pilgrim Revue) a french weekly paper for illustrated news. April 1915. Illustr ee Del la Semaine April 1915. Around the time of the Battle of Ypres. The caption reads that the dog is working as a medical assistant and wearing a spiked helmet. The Dogs Of War 1915. Dogs have made an important contribution in this war. 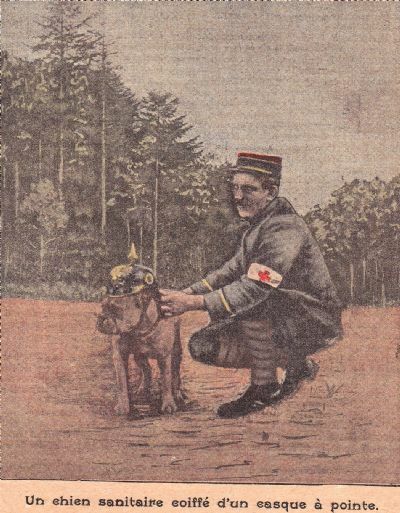 The dogs are trained to bring back to camp the caps of soldiers and it is marvelous to see the attachment to their handlers. Barking and tugging at their handler's coat they lead them to the injured person impatiently awaiting their arrival in the field. They even perform feats of another kind according to these 2 stories. Eclaireurs a quatre pattes ..................The Scout with 4 legs. In the Belgium Flanders, the Germans held onto Boesinghne Woods which they (the French) had an interest in. They needed to know the number of men there. Was it an imposing force? An artilery unit? Unable to use aeroplanes or cavalry as the wood was too thick it fell to the dogs of war brought in from the military headquarters in Dixmude. They were to go on the search. They came accompanied by their master, an infantry Corporal, for a dog works better if handled by the same person, they follow the voice commands they are used to. When they arrived, the dogs were placed in the same quarters as the Corporal and they sat around him in a semi circle with a fixed gaze waiting for their cue. Their master presented them with berets along with German caps and hankerchiefs, all of which have a German scent. Then he gestures towards the woods and no where else. Each dog wore a coat of brackens and tree branches so that their heads are covered in green. Only the jaws and the eyes were uncovered. When the dogs were moving they looked like small bushes rolling around on the slope. The word was "Go". They jumped into a green clearing, their advance was slow, it was necessary to keep them in sight for if you lost them for an instant one wouldn't find them again. They reached the path, one of them passed by a dead German sentinel and soon they disappeared again. The dogs are trained to distinguish between a prostrate living man, a dead man and to pass by able men standing..
After 1/2 an hour later they returned from the reconnaissance mission carrying various German head gear, allowing their handler to access the enemy strength. Bac has retrieved the cap of an infantryman carrying the number of the regiment, Ruff the cap of a Colonel, North the cap of a gunner and Podge the cap of an infantryman, Pell returned with a bloodied Frenchman's cap. Again they formed a semi circle around their master. There is meant to be a whole German regiment in the woods. Ruff always retrieves the caps with the most braid. Podge retrieves the caps of the soldiers and his collection shows there is hardly any army in the woods. One colonel and a small regiment. A French soldier who is injured is found in the woods. The soldier had given his blooded cap to Pell and then Pell leads the medical team to the French soldier. There information was precise. The French troops were amazed . The Colonel was defeated within the hour. The 16 machine guns and a canon took on the 77 guns (the French). What greatly amused the French was seeing the large German officer red with fury and his hand constantly pressed against his bare skull. This was the Colonel who's helmet along with his toupee was stolen by Ruff. In the woods the small French soldier was found with a serious head injury and taken away by ambulance . When the woods were completely cleared of Germans all celebrated the valiant four paws and their contribution. A Mess Kit Worth Gold. The German trenches, relates a french soldier, are 60 metres away from ours. Slowly at certain times, day and night they, the French move ahead uphill. Eternal shooting. On this beautiful sunny March day to break the monotomy of existence they make a stew and play cards. What to do to the people opposite? Towards the end of the day a few of them head to the nearby village and return to the trenches with an abandoned stray dog found wandering in the ruins. With an old mess kit attached to his tail and let loose in the direction of the ememy the kit bounces on the stones in the night with the racket of all devils. In his desparate escape the dog bumped the wire that protects the trenches of the ememy and believing an attack, the Germans open fire. For a good 20 minutes rifles and machine guns fire in a rage. The 77 (French) in turn sprinkled between the 2 trenches minimal fire. As for the good dog our accomplice, his mission finished, he returnied to our lines healthy and safe and free of his burden. He earned his celebration of a filled mess kit of excellent grub. The brave animal had earned it. His escapade had cost our ememy more than 3000 cartridges and 150 shells.